leave it to Wayne Coyne to create wacky. 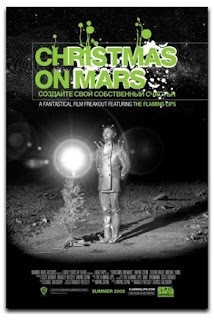 The Flaming Lips' first feature film, 'Christmas on Mars'. Written and directed by Wayne Coyne, and featuring all of the band and many of their associates, the film tells the story of the experiences of Major Syrtis during the first Christmas on a newly-colonised Mars. Wayne has compared the film to, "Maybe 'Eraserhead' or 'Dead Man' crossed with some kind of fantasy and space aspects, like 'The Wizard of Oz' and maybe '2001: A Space Odyssey,' except done without real actors or money, and set at Christmas-time." and the story that unfolds is intended to hint at 'childlike' magic within a tragic and realistic situation.